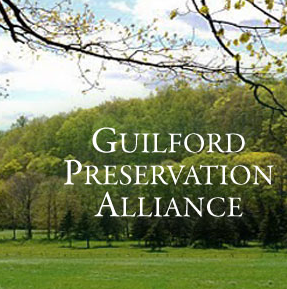 Guilford Preservation Alliance (GPA) is a non-profit group in the town of Guilford, CT, whose mission is to preserve and protect the built and natural heritage of the town of Guilford. Incorporated in 1980, the GPA has been active in promoting the preservation of the diverse buildings, landscapes, and streetscapes that contribute to the quality of the town of Guilford. Includes the recently updated survey of architecturally significant structures. The Guilford Keeping Society collects, preserves and shares the history and heritage of Guilford, CT for present and future generations. The Hyland House Museum in Guilford, Connecticut, is one of New England’s oldest house museums whose mission is to share the community’s rich colonial history and to inspire ongoing stewardship of that legacy. The Dorothy Whitfield Historic Society purchased the House in 1916 and opened it to the public as a museum in 1918. 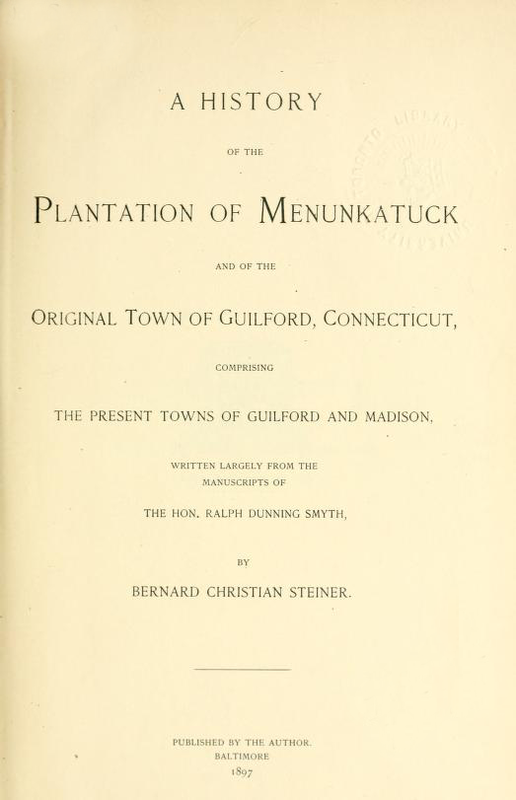 Digital copy of A history of the plantation of Menunkatuck and of the original town of Guilford, Connecticut : comprising the present towns of Guilford and Madison by Bernard Christian Steiner, 1897. Looking for the Grave of an Ancestor? Find information on local historic cemeteries here, or you can visit the library and use the books and maps located in the Historical Room. Search or browse cemeteries and grave records by clicking here. Take a look at Guilford’s Historic cemeteries by clicking here. Boston Street (across from 344 Boston Street). Contact: Ray Dudley (203) 453-4384. Established circa 1818, Alder Brook cemetery is Guilford’s largest cemetery and is located east of the Town Green. It is the resting place for many of Guilford’s earliest residents. Off Route 77, just above Great Hill Road on the the left. Contact: Robert Ashman (203) 453-0489. This private cemetery is the burial site of the Foote and Ward families of Guilford. 2804 Boston Post Road (corner of Moose Hill Road and Boston Post Road). This private cemetery is the burial site of the Fowler Family. This private cemetery is the burial site for members of the Goldsmith family. Nut Plains Road (east side intersection of Nut Plains and Goose Lane). Contact: John Sullivan Jr. (203) 453-4460. Ledge Hill Road (Western side of intersection of Ledge Hill and Long Hill Road). Contact: Donald Homer (203) 457-0107. Route 77 (across from 5 Durham Road). Contact: Saint George Church (203) 453-2788. Three Mile Course (off Boston Post Road).